As with the other recipes, I’ll show you how to install and configure the needed components. The end result would be that local syslog (and tailed files, if you want to tail them) will end up in Elasticsearch, or a logging SaaS like Logsene (which exposes the Elasticsearch API for both indexing and searching). Of course you can choose to change your rsyslog configuration to parse logs as well (as we’ve shown before), and change Logstash to do other things (like adding GeoIP info). This tells rsyslog to do a config check. It does NOT run in regular mode, but just check configuration file correctness. This option is meant to verify a config file. To do so, run rsyslogd interactively in foreground, specifying -f <config-file> and -N level. The level argument modifies behaviour. Currently, 0 is the same as not specifying the -N option at all (so this makes limited sense) and 1 actually activates the code. This configuration check will only check the configuration for integrity like syntax. Additionaly, the modules will be loaded to make sure that they work properly. On the downside, since the engine will not be loaded, errors with permissions or alike cannot be checked. These will occur only when running rsyslog normally. The verdict for this option is, that it is quite useful for a first check if the changes were correct, without running the configuration in live mode. This might help to prevent that rsyslog gets restarted with a basically wrong configuration and thus rendering rsyslog useless, because it might not work or not work properly. As you can see, we configured the action queue with some custom variables in the old fashion, basically the action queue and the action itself with the new style. If you create a new debug file now and review it, search for “action 1” in this case. You should see the following. This screenshot is a excerpt of the debug log. I marked several positions. The green circles show, that the action parameters have been used correctly. 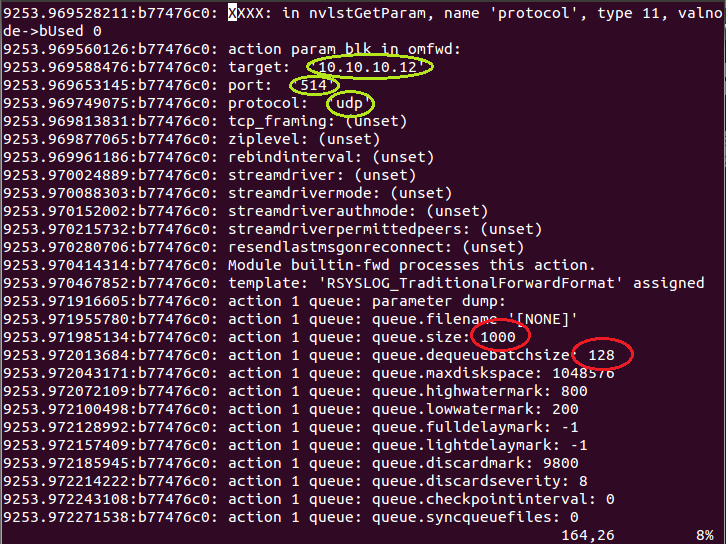 The red circles show two of the action queues parameters, where the defaults have been used. This is just a example on how to identify, if your configuration was loaded successfully. The actual input/output modules are better copy templates. Instead, the now-removed modules cost time for maintenance AND often caused confusion on what their role was. Was only accepted if it was the first PRI in a multi-filter PRI. Thanks to forum user Mark for bringing this to our attention.